Making their first trip to Hugoton since 2000, Liberal won 57-43. The Redskins were able to get points in transition in the second half to pull away for the road win over the third ranked team in 3A. The Redskins led 9-8 after one quarter and 21-20 at the half. LHS bolted to a 40-30 lead after three. The Skins led 45-31 with 4:59 to play. They struggled making free throws and layups down the stretch but won. Hugoton’s Zack Leininger, who averages 14 points and eight rebounds per game, was injured in the first half and did not play in the second half. Both teams struggled at the foul line as LHS was 14-26 at the foul line. They shot 48 percent from the field and were 3-10 from three point range. 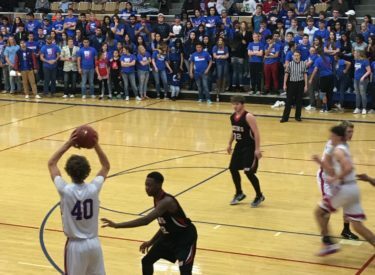 Hugoton was 9-19 at the foul line and 3-17 from three. Liberal got 16 from Markalyn Eatmon and 15 from Kylan Thomas. Cade Hinkle scored 12. Deladris Green had seven points and 14 rebounds before fouling out. The Redskins are 11-2 and the Eagles are 11-2. The Redskins bring the 2-1 WAC record back to conference play at Great Bend Friday night at about 7:45 on 1270 and kscbnews.net. The Eagles have a GWAC showdown with Holcomb Tuesday night in Hugoton.